Usain Bolt declared himself "the greatest athlete" to have lived after sealing an Olympic sprint double. "I'm a living legend," he said, after becoming the first man to successfully defend both 100m and 200m titles. Before Thursday's 200m final the Jamaican had suggested he could break his own world record of 19.19 seconds. Afterwards, he admitted: "I was fast but I wasn't fit enough," before sounding an ominous warning: "I am not ready to retire. I love this sport." 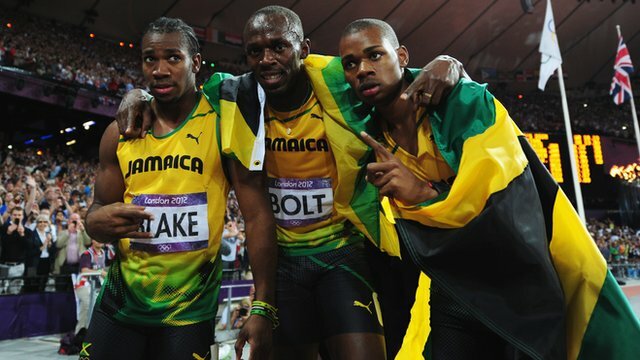 Jamaica completed a clean sweep in the 200m, with Yohan Blake winning silver and Warren Weir bronze behind Bolt's 19.32 seconds. "We pushed each other and we're happy," declared Bolt after the race. Although he broke neither the World nor Olympic records on this occasion, Bolt was full of joy and bravado in the post-sprint media conference, insisting he had left a permanent imprint on the sport. "I'm now a living legend," Bolt added. "Now I am going to sit back, relax and think about what's next. "I don't know what I really want to do after this, whether to run the 100 or 200 or try something else. I need to find a goal that's going to motivate me to great things. The rest of the season I am just going to have fun because “I did what I came here to do." Bolt led his compatriot Blake, 22, from the starting blocks but slowed as he neared the finish line. "I came off the corner, I could feel the strain on my back a little bit, so I was trying to keep my form," he said. "But I stopped running because I knew it wasn't going to be a world record. "I really wanted to do it in the 200m, but I'm happy. I came here and I gave it my all and I'm proud of myself." Greetings! Were you somehow able to execute all the options of your domain by yourself or you got professional help?